Janelle Finamore was professionally trained in voice and piano by a top Broadway teacher based in New York. She later went on to study voice and music at the renowned Westminster Choir College in Princeton, NJ where she performed and traveled in various professional choirs. Janelle finished her Bachelor’s degree in Music at California State University with an emphasis in music therapy. Since then she has performed her music throughout Orange county, arranged church choirs, and taught music to students of all ages and levels for over ten years. Through the years she has successfully prepared her students for auditions, talent shows, recitals, and competitions. As a teacher she finds it rewarding to see her music students grow and flourish as musicians. Janelle emphasizes the importance of learning the rudiments of music to build a good foundation (vocal technique, scales, chord vocabulary, theory, song-composition, performing techniques), while also being fun and creative throughout the lessons. She tailors the lessons to each student based on their specific interests and strengths. She specializes in pop and musical theater and also teaches classical voice. Because Janelle is also a singer/songwriter and recording artist, she can incorporate songwriting, recording, and performance techniques into the student’s lessons if desired. She has recorded a full length album and has performed original and cover songs throughout Orange county in music venues. 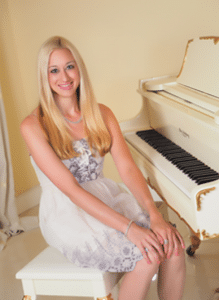 Janelle offers Beginner to Intermediate In Home Piano Lessons in Newport Beach for ages 5 and up. She integrates both classical and pop if so desired. She uses the Alfred series method books and Faber&Faber’s Piano Adventures. She uses a fun and educational approach while reminding students that daily practice is key to progress. 30 minutes or more of daily practice is recommended and will produce the best results. A more detailed explanation of her specific piano and voice methods are found under The Program tab. Janelle Finamore was professionally trained in voice and piano by a top Broadway teacher based in New York. Currently, Janelle helps everyone from kids to adults on improving their skills in voice and piano with her custom-tailored lessons.